In the early 1800s, European settlers in the southern United States blended their corn with a native variety. The result was Bloody Butcher corn: instantly recognizable for its striking deep red kernels and legendary fruity, buttery flavor. Unsuitable for industrial scale farming, this heirloom variety is grown by only a few farmers. 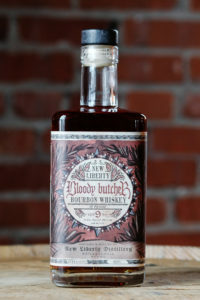 New Liberty Bloody Butcher Bourbon celebrates our nation’s early agricultural heritage. We sourced Bloody Butcher corn from Castle Valley Mill in Doylestown, PA, just 25 miles from our distillery, and combined it with malted rye and barley from Deer Creek Malthouse. This blend of corn, barley, and rye gives the bourbon a balanced flavor, with notes of milk chocolate, butter, leather, and stone fruit on the palate, and a dry spice on the finish. I consent to New Liberty Distillery collecting my details through this form.